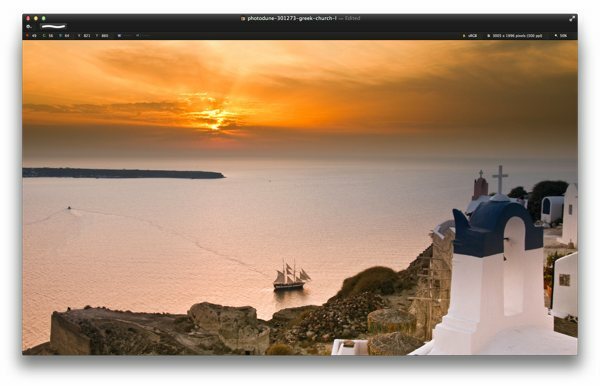 GFX9.COM share How to work with the clone stamp and healing tool in pixelmator, you can download now. 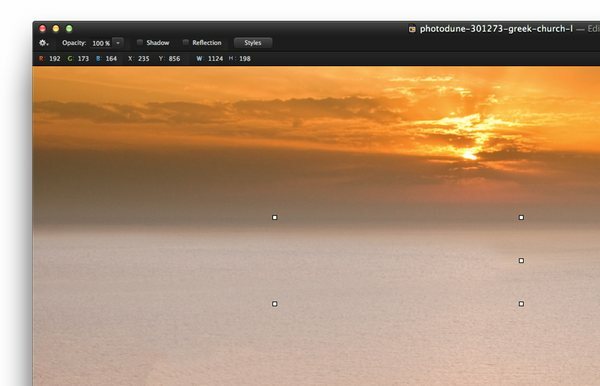 Tags: pixelmator, tools & tips. 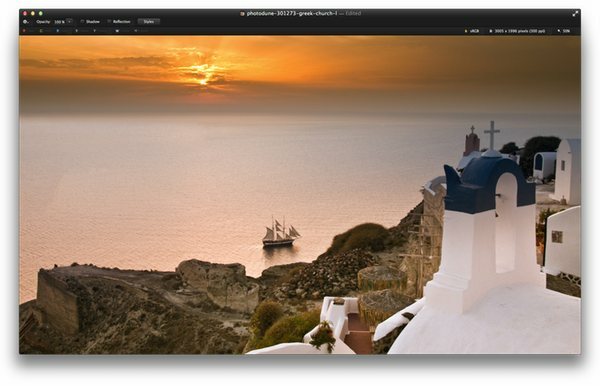 Pixelmator is an easy-to-use, fast, and powerful image editing app for the Mac. 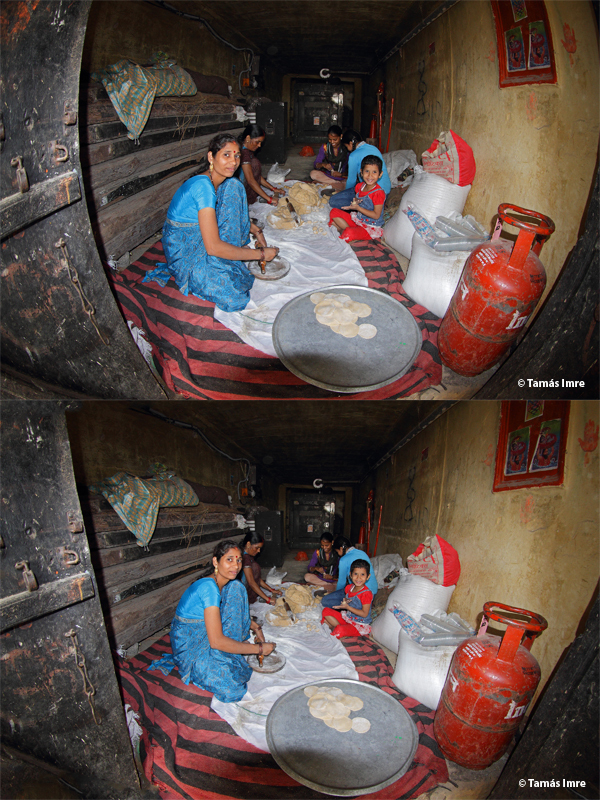 In this tutorial, I will show you how to use the Clone Stamp and Healing Tool to remove objects from a photo. Let's get started! Open the image (File > Open...) that you would like to remove some objects from. 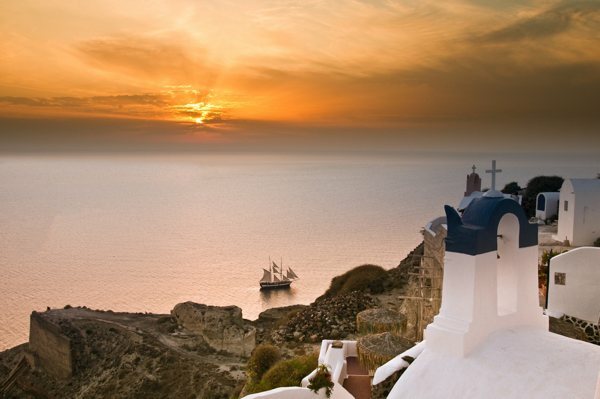 In my example I have chosen an image of some beautiful scenery from Greece. Let's examine the scene to see which elements are distracting and can be removed. 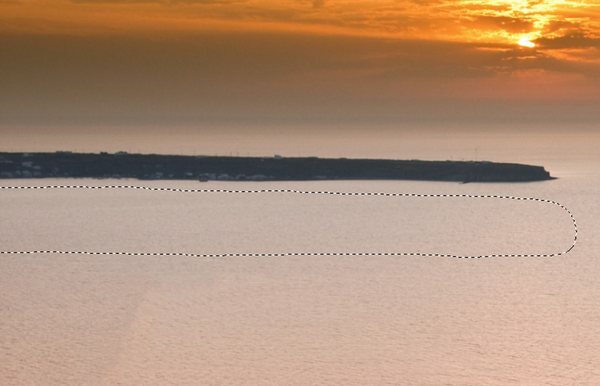 In our example image there are two small boats we can remove. One of the boats has made waves in the water that we need to remove, as well. Finally, there is a landmass at the to disturbing the ocean view. 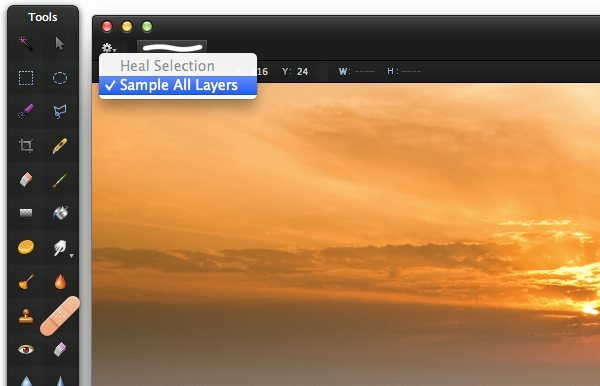 The Healing Tool is the easiest tool to use for cleaning up your images. 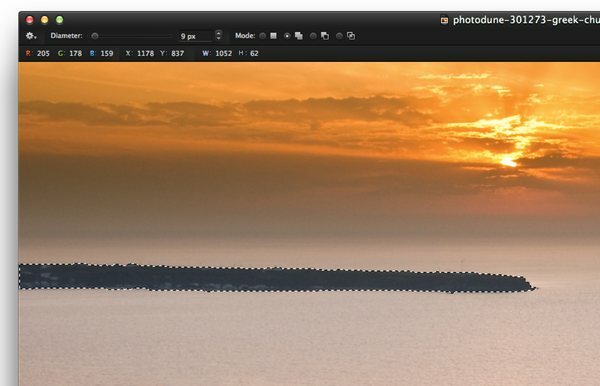 It is perfect for removing small spots from an image, like the two small boats. Before we start editing our image, you might want to apply your edits on a new blank layer so your original image stays untouched. After adding a new layer, we are ready to select the Healing Tool from the Tools Palette. Click on the Gear Icon on the Tool Options Bar and choose Sample All Layers. This will make sure that the healing tool samples from the original image while working on the new blank layer. 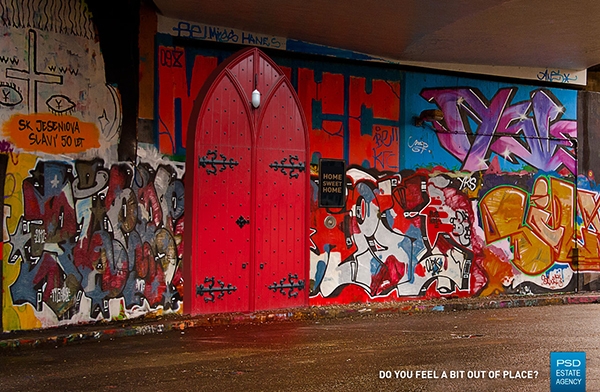 The Healing Tool uses a brush for painting over parts of the image we want to clean up. 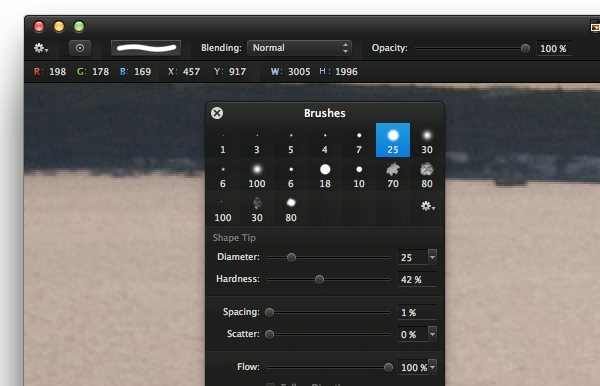 Click on the Brush Palette button on the Tool Options Bar to open the Brushes Palette. Normally, you would want to use a regular round soft brush. The diameter depends on how large the area is you want to use the Healing Tool on. 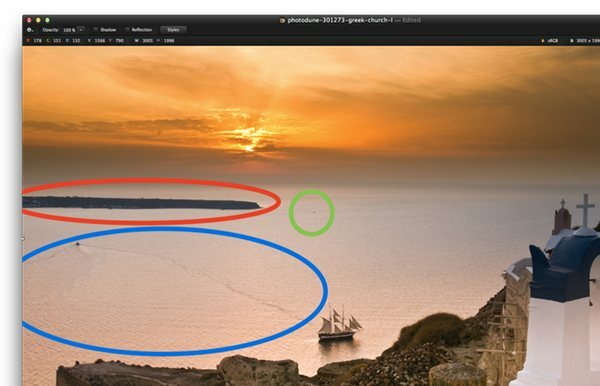 In our example, I use a small brush size that will cover the boats in the image with one click. 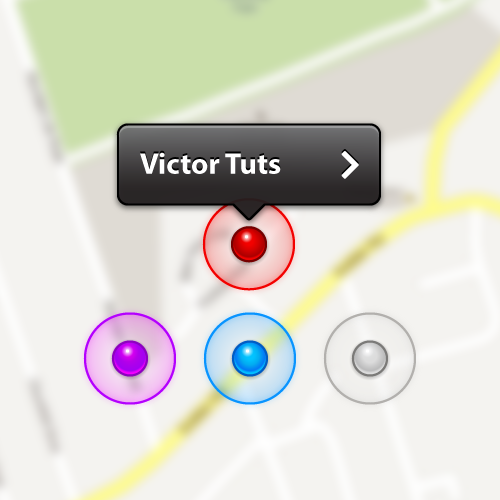 Use the Zoom Tool or the key-combination Cmd-+ to zoom in on the area we want to work on. 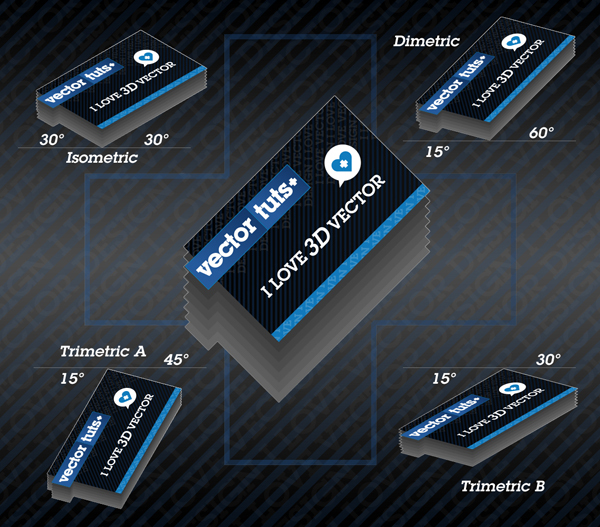 Zooming in will make it much easier to work more precise and detailed. Make sure you have the blank top layer selected and start painting with the brush over the area you want to clean up. In our case we click once with the brush on top of one of the boats. The Healing Tool can also heal selections. Use one of the Marquee Tools to make a selection around the other boat. Then go back to the Healing Tool and click on the Gear Icon on the Tool Options Bar. Choose Heal Selection from the drop down menu. 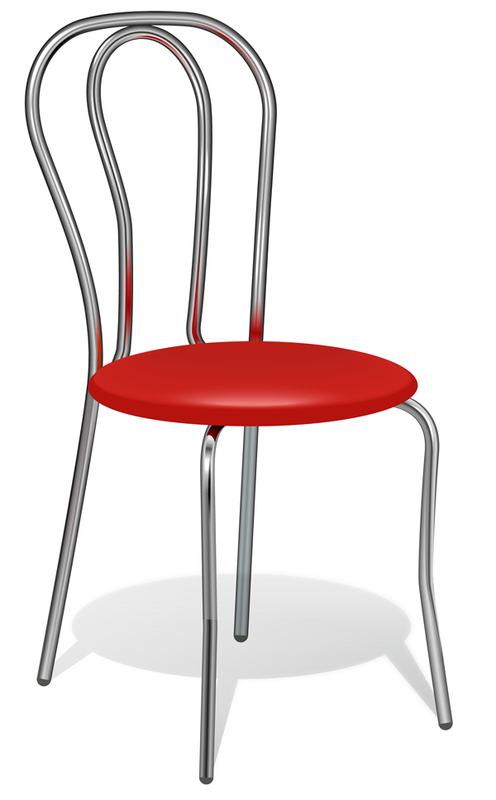 The Clone Stamp Tool is the ideal tool for removing more complicated areas from an image. 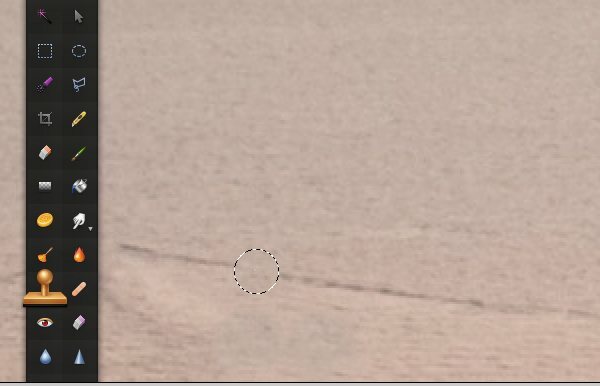 If we would try to remove the waves made by one of the boats with the Healing Tool we would notice that the Healing Tool will try to use the surrounding waves to cover the area we want to clean up, but fails to create a seamless pattern. 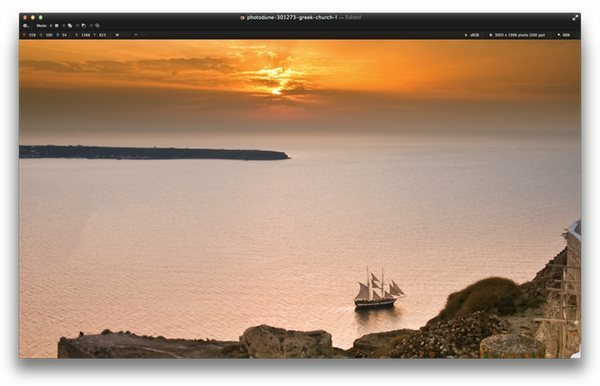 We need the Clone Stamp tool to tell Pixelmator what area to use to cover the waves from the boat. Select the Clone Stamp Tool from the Tools Palette. 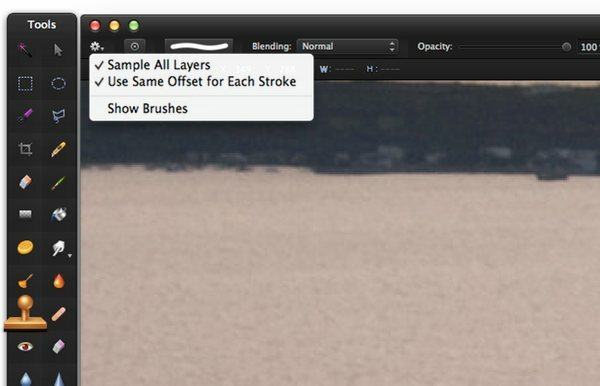 Click on the Gear Icon in the Tool Options Bar and make sure that Sample All Layers and Use Same Offset for Each Stroke are activated. The Use Same Offset for Each Stroke option makes sure that the clone source we choose will always be at the same distance from our clone brush. You'll see later how this works. 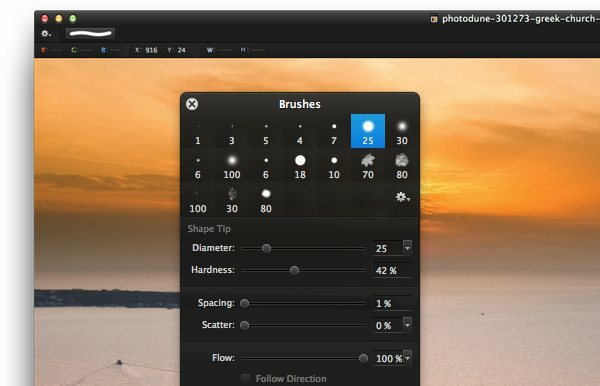 Click on the Brush Palette Button to choose a suitable brush from the Brushes Palette. In most cases you would want to use a similar brush as we had chosen for the Healing Tool. A normal round soft edged brush. 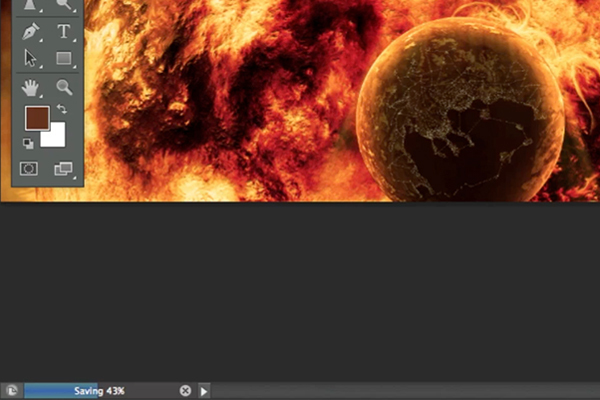 You see that we also can change the Blending mode and the Opacity of the brush on the Tool Options Bar. In most cases you want to use the Normal Blending Mode and 100% Opacity. The first thing the Clone Stamp Tool wants to know is what part of the image we want to clone from. If we haven't selected a clone source yet the mouse pointer will look like the mouse pointer in the image below. Asking us to click on an area we want to define as the clone source. 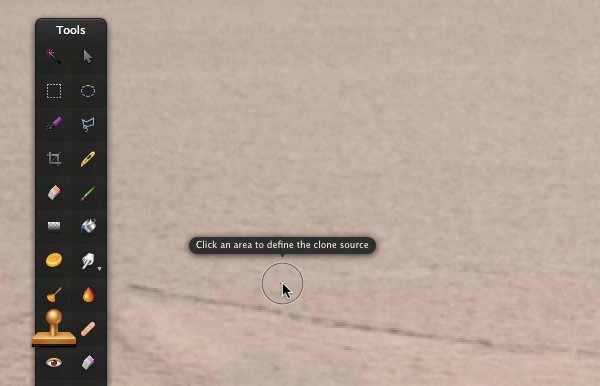 If we already have selected a clone source but want to define a new one, we can either click on the Clone Source Button on the Tool Options Bar or hold the Option key while clicking on the new clone source. After defining the clone source, the mouse cursor will change to the clone brush. Inside the brush you'll see the clone source we just selected. We can now align the clone source perfectly over the part of the image we want to clean up. Start painting over the area you want to remove. You'll see a small cross following our brush indicating where our clone source is. 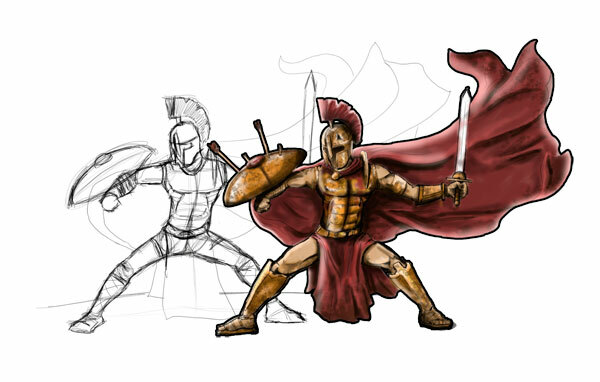 You'll see that if follows our brush perfectly, making sure that any color changes get cloned as well. The clone source will stay positioned at the same distance from the brush at all times because we have activated the Use Same Offset for Each Stroke option. If this option wasn't activated and we would have stopped painting, the clone source would have stayed at the position where we released the mouse-button. Continue painting with the Clone Stamp Tool until the whole area is cleaned up. 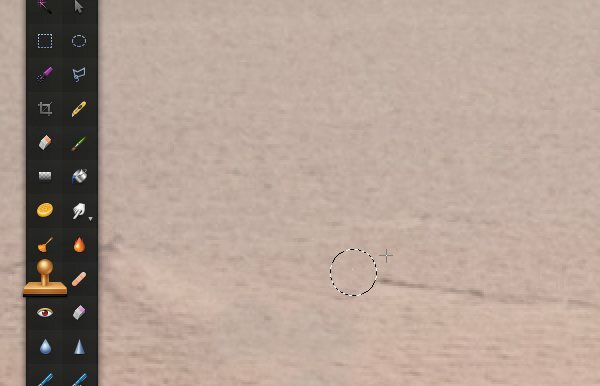 In our example image I ended up removing all the waves made by the little boat with the Clone Stamp Tool. I used the healing tool afterwards in some areas where the result of the Clone Stamp Tool left some visible color differences. Experiment yourself using your own image to find out what works best for you. In this part of the tutorial we are going to remove the landmass in our example image using a technique called Patching. We start off by selecting the landmass itself using one of the selection tools. In our example I used the Paint Selection Tool to quickly select the landmass. 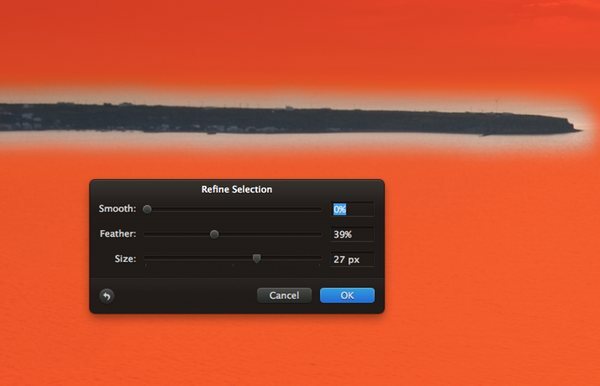 Choose Refine Selection from the Edit Menu. Increase the Feather to create a soft edge and increase the Size of the selection. Click on OK when done. Make sure to have one of the Selection Tools selected in the Tools Palette. Click inside the selection and drag it over the part we want to use as a patch. 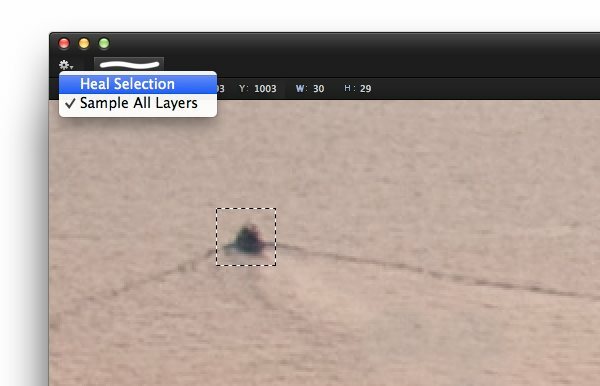 Make sure that we have our original layer with our original image selected in the Layers Palette and use the key-combination Cmd-C to copy the selected part. Use the key-combination Cmd-V to paste the contents of the selection onto a new layer. 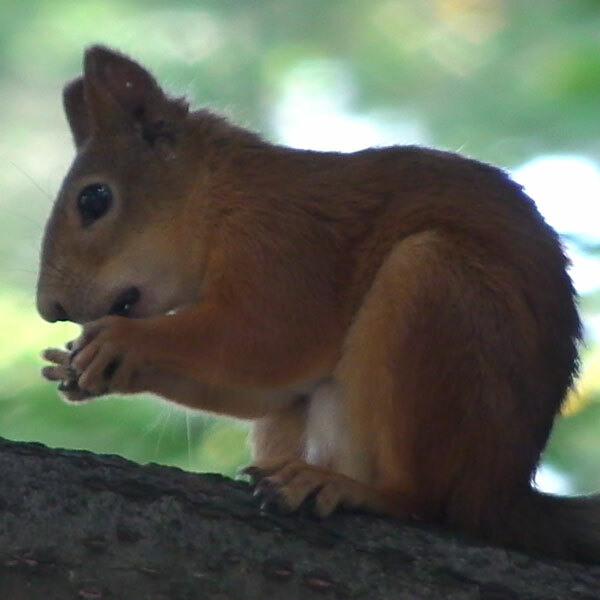 Deselect the selection ( Cmd-D ) and use the Move Tool to move the patch over the part of the image we want to remove. 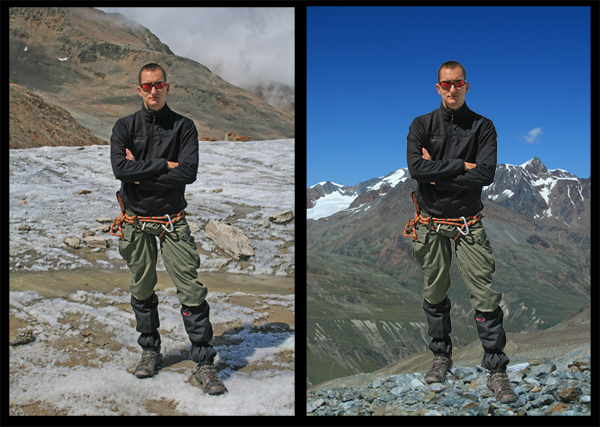 Use the Healing Tool and the Clone Stamp Tool to make smoother color transitions between the patch and the surrounding area. 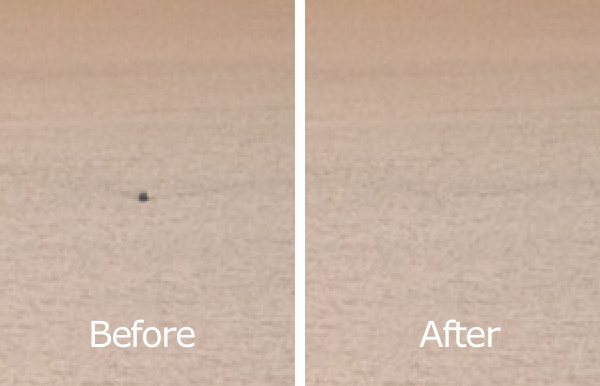 We've successfully removed some distracting elements from our image by using the Clone Stamp Tool, the Healing Tool and the Patching technique.